Axiomtek's SBC84825 low-power 3.5" embedded board comes with the latest Intel Atom processor Z510P 1.1GHz or Z530P 1.6 GHz and Intel System Controller Hub US15WP. The onboard DDR2 SODIMM slot implements up to 2GB of system memory. The system only requires +12V DC power input. The combination of small-footprint, low-power consumption and fanless operation makes this platform well-suited for many embedded market segments such as in-vehicle infotainment, industrial control and automation, gaming, medical devices, self-serve terminal, digital signage, and other small, fanless and battery operated devices. 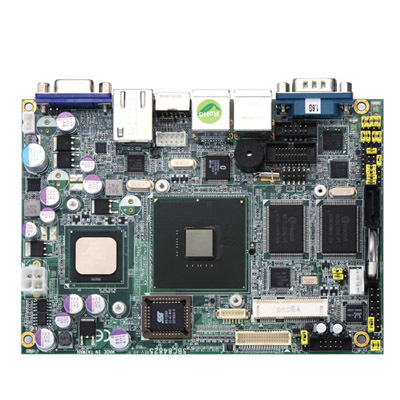 Incorporating Intel System Controller Hub US15WP, the SBC84825 includes Graphics Accelerator GMA500 that supports advanced 3D graphics and 256 MB of graphic memory. Multiple displays are supported by a 24-bit LVDS interface and VGA port.